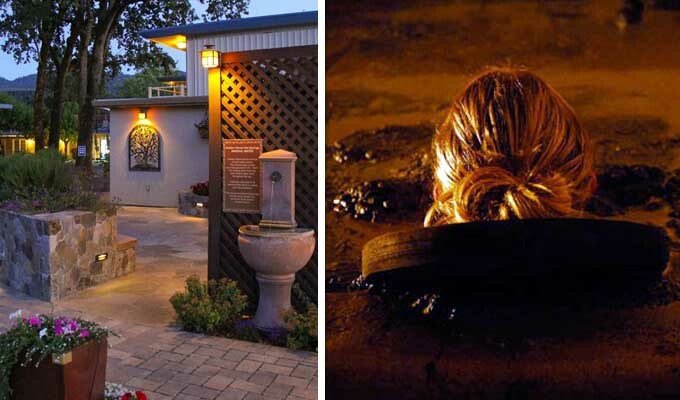 Although famous for its top of class wineries and restaurants, the Napa Valley region is also very well known for another activity: mineral baths, mud baths, and massage therapy. 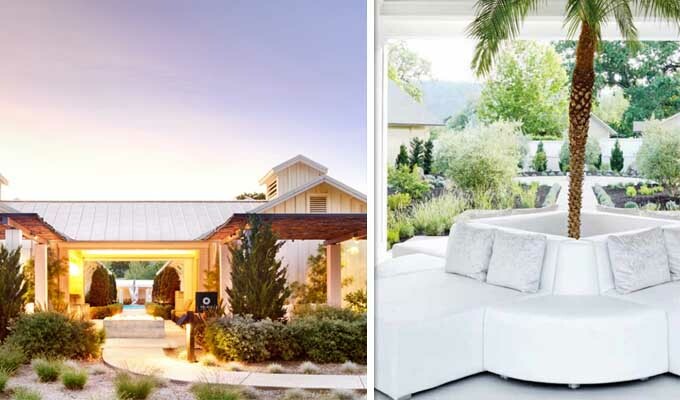 Located at the north end of Napa Valley, the town of Calistoga has become the go to place for complete relaxation and pampering. 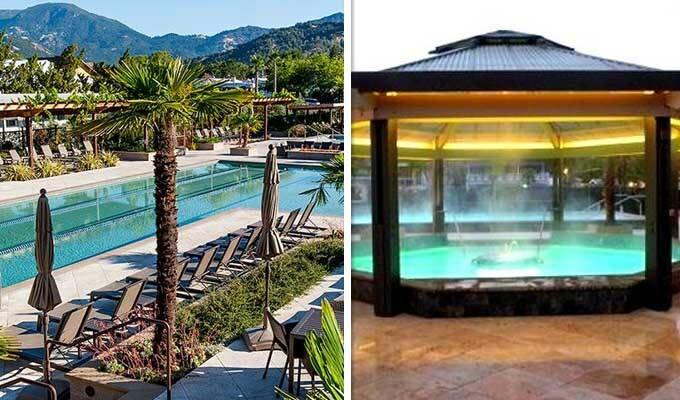 From the many spas, mineral pools, and mud baths, we’ve compiled a list of spas and resorts that will help you get away from it all. An underrated gem, Golden Haven is a wonderful resort without the high price tag. Recently renovated, the spa has the feel of a posh motel where you can park right in front of your door. Book a mudbath, facial, or massage and then relax in the sunshine outside by the mineral pool. Complimentary bicycles are available for leisurely ride into town. Bring a picnic and play some bocce ball as you relax the day away. Insider tip: Golden Haven is one of two places that offers a couple’s mudbath. 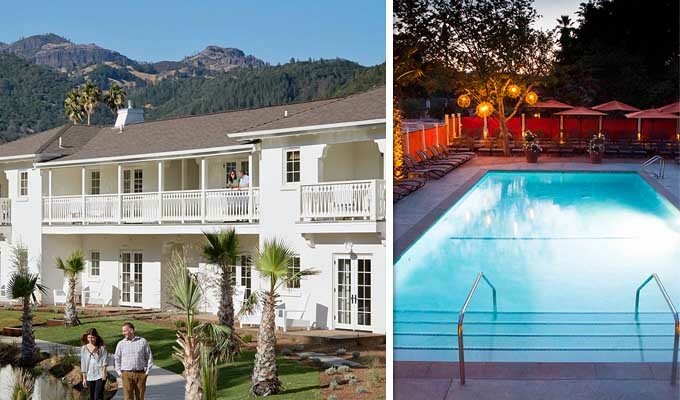 After a long day of hiking or wine tasting, Calistoga Spa Hot Springs features four mineral pools, including a kiddie wading pool and a jacuzzi pool heated to 104 degrees. 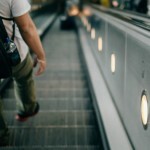 Worried about leaving your workout behind? Calistoga Spa Hot Springs has a full fitness center with personal trainers and classes. Insider tip: Book a soothing spa treatment, massage or mud bath and receive 20% off your overnight stays. 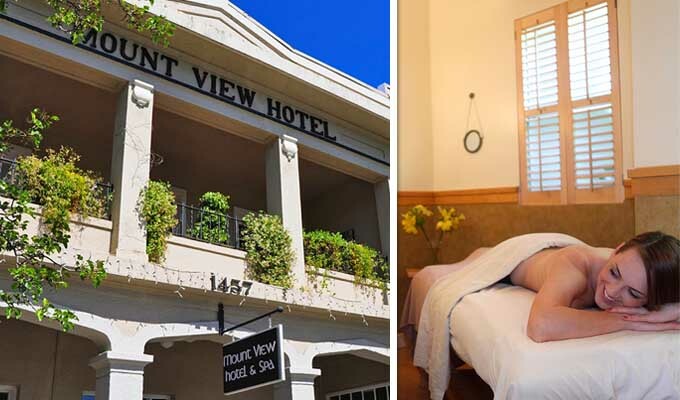 With its art deco design and motif, Mount View Hotel and Spa has a rich history that spans over 100 years and includes a spot on the National Register of Historic Places. From facials and body wraps to massage and hydrotherapy, the spa menu offers everything you need to relax the stress away. There are spa packages for individuals or couples and a relaxation package for groups of six or more. Stay overnight and enjoy access to the backyard pool, whirlpool, and wine tasting. Insider tip: Mount View offers shuttle passes into Napa Valley so you can experience the wineries in the area. Truly get away and pamper yourself at Solage Calistoga Resort and Spa. This top tier resort provides a luxury spa experience that includes a fitness center, bathhouse, and mudbar. After unwinding by the two swimming pools, enjoy a Michelin rated dining experience at Solbar. The friendly staff will go out of their way to make your stay relaxing and memorable. Pets are welcome, too. Insider tip: Current owner of a Mercedes Benz? Make sure to take advantage of the Mercedes Benz Owners package. Go back in time with Indian Springs Resort and Spa. A favorite getaway for old Hollywood celebrities like Lucille Ball and Desi Arnaz, the resort is California’s oldest continuously operated pool and spa facility. Located on 17 acres which include an olympic size mineral pool, Buddha pond, gardens shuffleboard, and croquet, Indian Springs will take you completely away from everyday life. Take a mudbath or get a massage and facial before dining at the new restaurant, Sam’s Supper Club. Insider tip: The spa has a few outdoor rooms where you can get a massage outside in the fresh air. A wine country icon since 1946, Dr. Wilkinson’s Hot Springs Resort is as casual as it sounds. The term “The Works” was originally coined by “Doc” Wilkinson to describe the combination of a mud bath, followed by a mineral bath, steam room, blanket wrap, and massage. Now, almost 70 years later, the resort is considered a Calistoga institution and “The Works” is still a main staple of the spa menu. With its family friendly atmosphere, reasonable rates, and vintage charm, Dr. Wilkinson’s is the place to go if you want fun added to your relaxation. Insider tip: Take the mudbath experience with you by purchasing the custom blend of Dr. Wilkinson’s Terraceuticals™ Mud Masque. 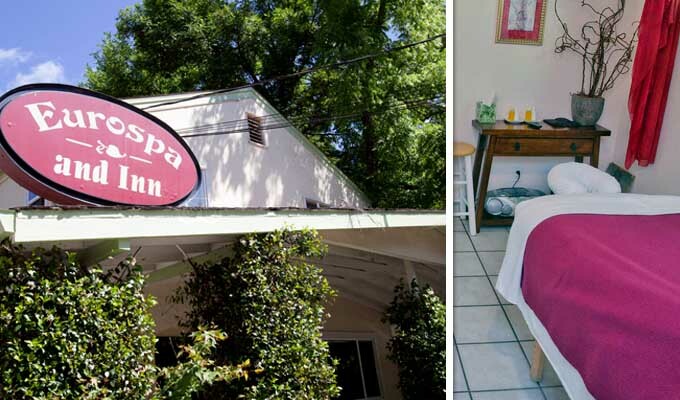 Charming and quaint, Euro Spa and Inn provides a much more intimate experience than the larger resorts. Although smaller and tucked away from Lincoln Avenue, it still runs big on service and amenities. You can choose to completely relax with the many spa treatments available or workout in the fitness center with classes and a personal trainer. 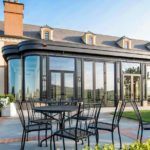 Wind down before dinner with a glass of wine and snacks provided on the patio. Staying overnight? Wake up to a lovely continental breakfast on the patio. 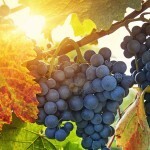 Insider tip: Planning to wine taste? The hotel provides a nice all inclusive tasting package with a professional and knowledgeable chauffeur. Lincoln Ave Spa is the perfect alternative to those looking for the mud bath benefits but don’t want to immerse completely in a tub. Here, the mud is individualized and prepared exclusively for each client and then applied to the body—much like a body facial. Along with the mud treatments, the day spa offers massage, salt scrubs, facials, herbal wraps, european body wrap, aromatherapy baths, and steams. Insider tip: Go for a swim over at Golden Haven Hot Springs and Resort complimentary. 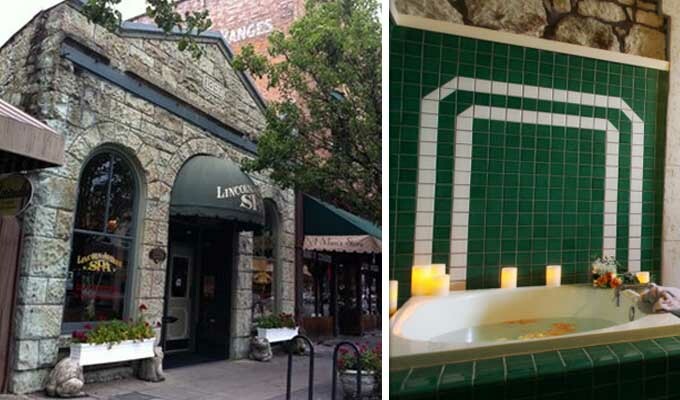 Excited to relax at any of these Calistoga spa experiences? Be sure to vote for your favorite below!